Our project for the Project Management 598 class was to create, plan and execute a strategy to support a charity of our choosing. We chose to support a charity called Feed My Starving Children (FMSC), which is an Illinois based nonprofit (founded 1987) which seeks to conquer malnutrition in poor communities. They are 100% donor funded! Volunteers package nutrient dense meals comprised of rice, soy, vitamins, minerals, and dehydrated vegetables which will be distributed worldwide to needy people. Each meal costs only 22 cents with 92 cents of every dollar going straight into the purchase and production. 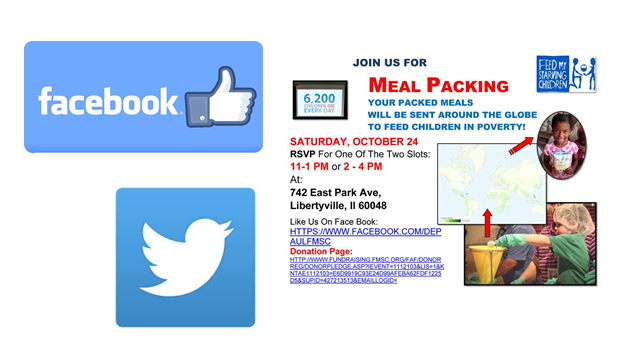 These meals are sent across the globe to over 70 countries (see map below), for children as well as adults. Many people are not aware of the spread of malnutrition in modern day. According to statistics from their website, a startling 6,200 children die from starvation every day. We hosted two micro events and one final service event, as well as well as developed active social media (awareness) and personalized website for fundraising campaigns. The micro events were organized to raise awareness and raise funds while Online media and personalized websites were utilized to promote the charity and raise funds. Our first micro event was a happy hour at Beercade, a vintage arcade bar located in River North, Illinois. The event took place on Wednesday, October 8th from 5pm – 8pm. Attendees paid a $10 donation entrance fee and 15% of our group’s sales were donated back to the charity. The primary objective was to raise awareness and raise funds. 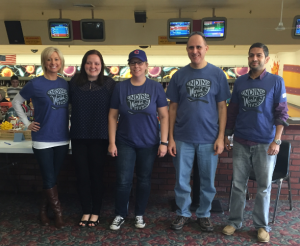 Walk in customers and Beercade employees shared the event and the charity with their connections through social media and word of mouth. 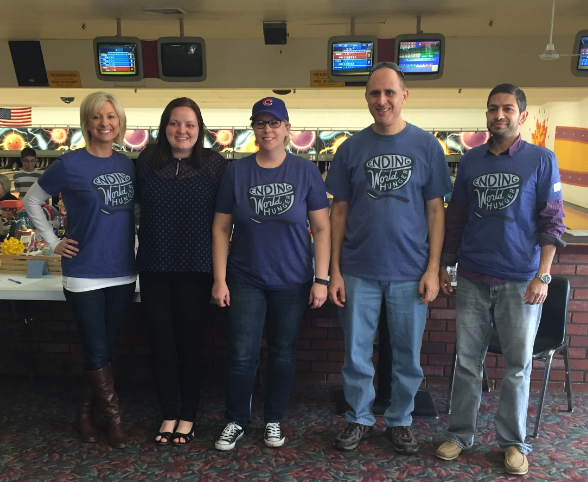 Our second micro event was bowling at River Rand Bowl in Des Plaines, IL on October 18th. Attendees paid $20 for one pair of shoes and two games. We also provided pizza and beverage to attendees. We were able to secure sponsorship from local restaurants who supplied free pizza for the event. In addition, we held raffles, silent auction, and a bake sale at the venue. This event was a major success as we were able to raise more funds than expected, raise awareness for the charity by talking to patrons and finally, by having a lot of fun. 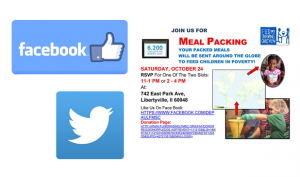 To raise awareness for FMSC, we created a Facebook page, a Twitter account and a personalized webpage. We were able to promote our events, share updates and request donations through these mediums. In addition, we promoted our events by creating flyers. We distributed and displayed them in libraries, at local businesses and churches. To raise funds for FMSC, we created a personalized webpage. We were able to collect most of our donations through the website. One of the advantages of having the website was that the donations went directly to FMSC and we didn’t have to deal with physically collecting donations and sending them to FMSC. We also collected offline donations which we submitted to FMSC in person. • Having a designated, dedicated, and dependable Project Manager on the team. We feel it’s important for the Project Manager to be collaborative and not authoritative unless when the project is not moving in the right direction. • Assigning responsibilities to each team member and holding them accountable is important. If a member is unable to meet a deadline, communicating that to the team early so others can pitch in also important. • Being able to pivot quickly or having a contingency plan is very important. Initially we started the team with 6 members. The team member who was assigned to coordinate the first micro event dropped out of class and we were left to scramble to identify another venue and event. Fortunately, we had a contingency plan so we were able to reassess and deploy the contingency plan immediately. • Assign a project manager immediately after the group has been selected and start on the events and marketing early. Ideally, someone with experience could be useful but not required. • When organizing events, be aware of other events going on in that location. Unfortunately for us, we had our first event on the evening the Chicago Cubs were playing a playoff game, so the turnout was not as expected. • Have a good communication tool and communicate well. We used GroupMe mobile app as our main method for most of our communications. Photos related to the project. Examples could be event photos, website, team members, etc. I interviewed our Director of Operations who is a Project Management Professional, certified through the PMI. During our interview she explained to me that the most important skill set for a project or program manager to have is people skills. It is imperative to have good people skills as a PM because much of project management is building relationships and motivating team members to complete their tasks as efficiently and timely as possible. Ingrained in the mentality of a PM should be the mindset of working together to achieve the goals set forth in the vision of the project. If a PM is rough around the edges or has a way of putting people off, they may discourage open communication. If a PM is a pushover and does not have authority and the respect of the team members, nothing will ever get done. A PM must be able to share responsibilities and hold people accountable through the dependencies others have on them. I was thinking about this and various teams I have been a member of and it reminded me of certain program managers that I avoid at all costs. Some of their characteristics which are unsavory are an inability to plan appropriately, threats, inability to see high level (bogged down in details), inability to drive results, poor budgeting, poor communication, and the like., Seeing as we spend so much of our time working and working with others in team settings, being surrounded by those who have deficiencies can be painful. Characteristics of good people skills include being a good listener, being able to refocused the group when led astray, air of authority which is non threatening, ability to delegate, proper identification of group members skills and talents, good communication, ability to problem solve, and a ability to motive. I appreciate the times when I am able to work with a well functioning team; one which makes progress and works together to achieve goals. Being a good team member is also important but the ambiance is set from the PM and if they are not effective it is easy for the team to get off track or not be able to overcome hurdles. I’m not sure how much of this can be taught. My Director of Operations told me that part of the classes she took for the PMP certification included a class on leadership and teamwork. She told me she learned a lot from that class. Just having one class can be problematic. PMs need training and experience to be able to navigate choppy waters and lead the team straight. If that can be done in one class, then great, but that seems unlikely. Behavior needs to be reinforced, which takes time and willingness to accept consequences. I happen to agree with the Director of Operations for my company; people skills are first and foremost. This is clear to me in daily work environment how important it is to cultivate relationships but having these in place on a project or program is critical. Proper management and disciple of project financials is an important aspect of project management. Along with managing the scope, timeline of a project, and following the key deliverables by team members, financial management ranks as one of the most important aspects of the project. Many projects benefit from the assistance of a Financial Analyst dedicated to updating and maintaining the project costs, project forecasting, and budgeting. However, not all projects are lucky enough to have such a dedicated resource, therefore knowing how to manage finances is important for both project managers and team members alike. This article, “The Financial Aspects of Project Management”, outlines several key components to which attention is needed in order to maintain the project finances. The authors discuss cost concepts such as direct and indirect costs, labor rates, overhead rates, and pricing and billing rates. The importance of understanding these concepts is imperative because these costs will be charged to the project and will be important in measuring different Key Performance Indicators as the project progresses. Accurate timekeeping is identified as one of the most important duties in managing project financials. This can not only affect the costs charged to the project but can also affect the billing rates to customers from project work. Protecting customer relationships by guaranteeing sound data and fair pricing is an important part of managing the project. The importance of this can be magnified when dealing with government projects as mistakes can result in voiding contracts and a losing lucrative government business. Another important function identified in this article is having a good cost tracking and budgeting system to keep organized and diligent. The authors focus on two types of costs on which having a good system is helpful for managing them. These are labor costs and expense reports. The importance of labor costs is larger than just having the ability to accumulate and bill out to customers appropriately because other costs including fringe benefits can be added or allocated to base wage rates in order to have completed labor wages. Expense reports can be very tricky as often some expenses are chargeable and billable and others are not making a tracking system important to help identify potential over or undercharging of the project. A very good suggestion coming from this article for managing project financials is setting project spend milestones. This allows the project manager to have a benchmark to compare to as the project progresses so they can understand how they are coming along relative to budget, and if additional approvals might be needed ahead in the project for unplanned spending or overage which was unidentified during the project planning phase. This often happens as it is difficult to be able to anticipate and plan for every cost which will come through. Overall, this article “Financial Aspect of Project Management” is a very good guide for the non-finance manager to help get organized and know what costs to pay attention to and how they might affect the project. Unfortunately, financial management is not easy and if it cannot be assigned to a dedicated specialist in the area, project managers must be able to step up and navigate through the financial flows of project costs. Staying on top of these using systems and milestones can really make a difference as the project progresses, allowing the manager to have more complete control of their project.